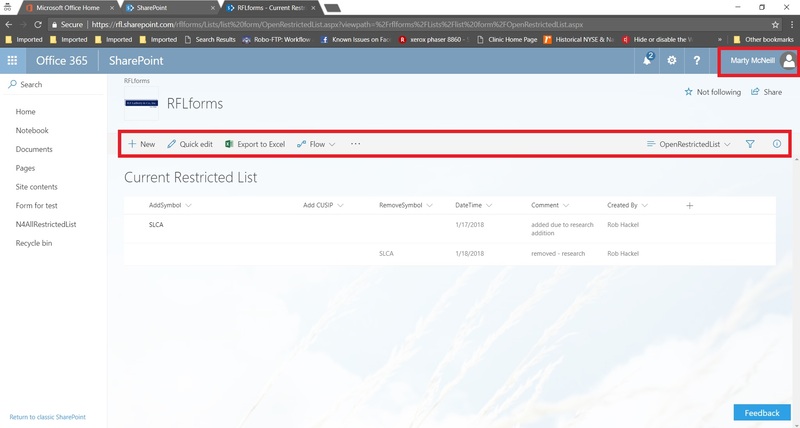 We have a List where data is fed through a form i.e (+ New), I would like to restrict it in a way that majority of the Sharepoint users can only view the List and not be able to access the options in the red box. Only assigned users can have access to the red box. Just created a Sharepoint Slide Library on Office 365 but when I click on "Upload" then select "Publish Slides" I get the error "This feature requires Microsoft PowerPoint. Either the application is not installed, or your browser is not configured to support ActiveX controls. I have PowerPoint 2016 installed ( other users get the same error with PowerPoint 2010 installed). I have also reset my IE (32 bit) security settings to default. Any help would be greatly appreciated.